Mucopolysaccharidoses (MPS) are a family of inherited metabolic diseases that results from the deficiency of lysosomal enzymes involved in the degradation of the glycosaminoglycans (MPS). We report here a 7-year-old female child who presented with complaints of short stature, skeletal deformities, and difficulty in walking with normal intelligence. A clinical diagnosis with differential diagnosis of achondroplasia/rickets was considered. Skeletal survey showed radiological features characteristic of Morquio syndrome (MPS IV) which lead to diagnosis in this case. Morquio syndrome (MS) (mucopolysaccharidoses Type IV [MPS IV]) is a member of a group of inherited metabolic disorders collectively termed MPS. In 1929, Morquio, a pediatrician in Uruguay, and Brailsford, a Radiologist in England, simultaneously described cases of what is now believed to be MS., Hurler coined the term dysostosis multiplex to describe the constellation of skeletal findings specific to patients with MPS and other lysosomal storage disorders. Patients with MS can be clinically distinguished from other forms of MPS in that their intelligence is unimpaired. The diagnosis can be made based on the physical, radiological features, blood enzymes, and skin biopsy. 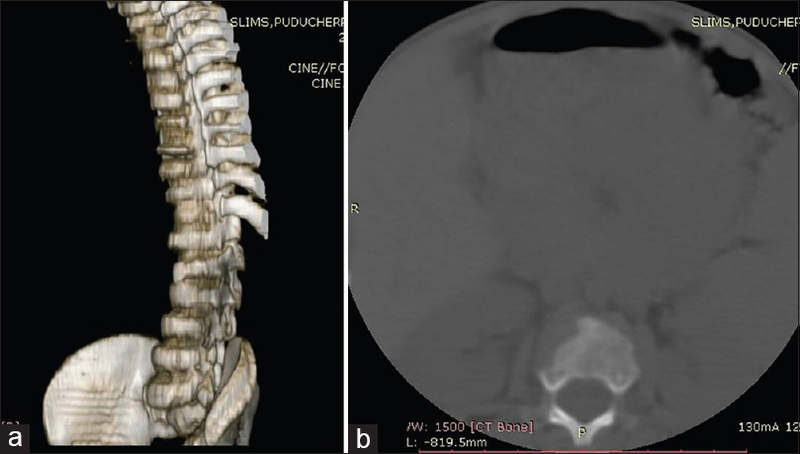 This is a case report where the typical radiological features in correlation with other findings had led to the diagnosis of MS.
A 7-year-old female child presented with complaints of short stature, spinal deformity, and difficulty in walking. There was a history of poor weight gain and growth. Physical examination showed pectus carinatum, short neck, frontal bossing, knock knees, kyphosis, projecting jaw, broad mouth, and flat feet with an abnormal gait. There was marked hepatosplenomegaly. Intelligence was appropriate for age. Weight of the child was 20 kg and height was 102 cm. The upper segment to lower segment ratio is 62:40. Slit-lamp examination, electrocardiogram, and audiometry were normal. Clinical differentials of achondroplasia/rickets were considered and the child was started on Vitamin D and zinc. Skeletal survey was done, where anteroposterior radiography of both hands with wrist revealed conical (bullet-shaped) proximal bases of 2–5 metacarpals with normal construction of metacarpal shafts. The ossified carpal bones were small and reduced in number for the patient age. The planes of both the distal ulnar and radial growth plates were slanted toward each other [Figure 1]. X-ray of the skull showed frontal bossing with J-shaped sella [Figure 2]a and [Figure 2]b. There were broadening of the anterior portion of the ribs (tongue shaped), with vertebra plana, kyphoscoliosis, and central beaking [Figure 3] and [Figure 4]. This can be distinguished from the ovoid vertebral bodies of Hurler's syndrome and other MPS. The central anterior beaking of vertebrae in MS also differs from the anteroinferior beaking seen in Hurler's syndrome and other MPS. The pelvic film showed flared ilium laterally with inferior constriction (wine-glass shape) [Figure 5]. 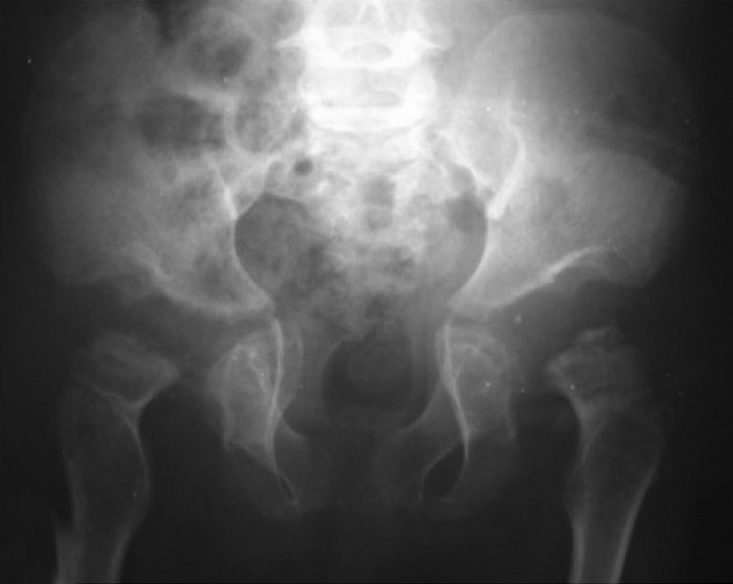 Frontal view of the pelvis with both hips revealed enlarged acetabular cavities with rough margins, and poorly formed femoral epiphyses and widened femoral necks with coxa valga [Figure 5]. All these typical radiological features with other laboratory findings confirmed this case as the rare metabolic syndrome - MS. The child is on supportive treatment with routine follow-up under monitoring for prevention of syndrome associated complications. The MPS are caused by a deficiency of lysosomal enzymes required for the degradation of MPS or glycosaminoglycans. Eleven distinct single lysosomal enzyme deficiencies are known to cause seven recognized phenotypes of MPS designated as MPS Type I through MPS Type VII. All the MPS are inherited in an autosomal recessive fashion except MPS Type II (Hunter), which is X-linked. MS is a genetic disorder caused by enzyme deficiency responsible for the breakdown of the MPS keratin sulfate. The resulting build-up of keratin sulfate causes a specific pattern of abnormalities. Patients with MPS IV can usually be clinically distinguished from patients with other forms of MPS as their intelligence is unimpaired as seen in this case where the child has normal intelligence. MS is a rare disease. The exact incidence in India is not known. The estimated incidence of MS covers a wide range including 1 case per 200,000 births in British Columbia  and 1 case per 75,000 births in Northern Ireland. Patients with MS appear healthy at birth. Montaño et al. conducted a study in which MPS IVA patients from 42 countries were included. A total of 326 patients (172 male, 154 female) enrolled in the Morquio A Registry Programme. The mean age of patients enrolled was 14.9 years for males and 19.1 years for females, with a wide range of 1–73 years. Sixty-four percent of the patients were under 18 years. Initial symptoms were recognized between 1 and 3 years of age (mean age 2.1 years) and mean age at diagnosis for the patients was 4.7 years. A progressive skeletal dysplasia was commonly observed among the MPS IVA patients. This patient also presented with complaints of growth failure and skeletal deformities which was noticed since the age of 3 years. 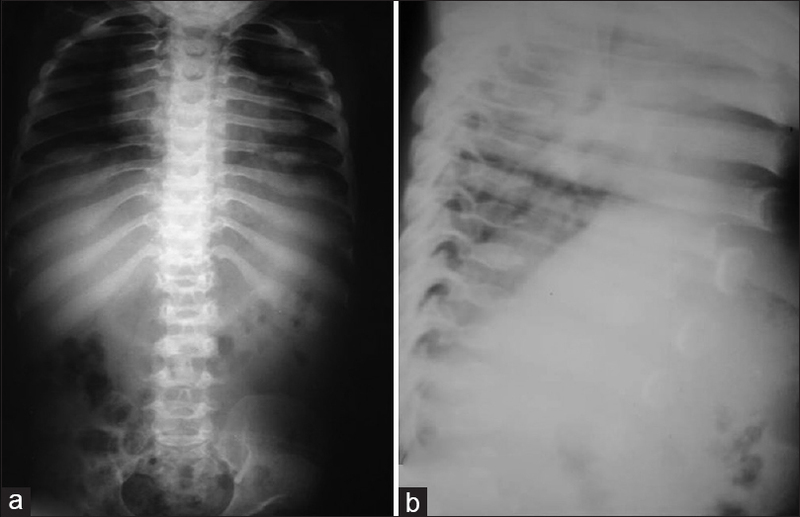 Marked dwarfism, abnormal curvature of the spine (kyphoscoliosis), and decreased tone and weakness are prominent early childhood presentations. Also seen are coarse facies, short nose, broad mouth, and widely spaced teeth with thinned enamel and hepatomegaly. The patient may have a waddling gait. Pectus carinatum (horizontal and protuberant sternum) and a shortened neck with clouding of the cornea, ligamentous laxity, and joint stiffness are also seen. This child also presented with most of the features such as short stature, pectus carinatum, short neck, knock knees, kyphosis, projecting jaw, broad mouth, and flat feet with an abnormal gait. Langer and Carey  compared the radiological findings of MS with other forms of MPS, MS tends to have greater skeletal manifestations and spine involvement such as scoliosis, kyphosis, hyperlordosis, severe gibbus, flaring of the lower ribs, as well as platyspondyly, pectus carinatum, bullet-shaped metacarpals, and small carpal bones (often with some absent). Characteristic findings included hypoplasia of odontoid peg, universal platyspondyly, gibbus and kyphosis of the dorsal region with widening of disk spaces. Also characteristic are a long pelvis with narrowing at the acetabulae, pubic symphysis widening, and flaring of the ilia. There may be shortening of the metacarpals, and inclination of the distal portions of the radius, and ulna toward each other can also be seen. Again all the characteristic findings were present in this child. Vertebra plana with kyphoscoliosis and central anterior beaking distinguishes this case from the ovoid vertebral bodies and anteroinferior beaking seen in Hurler's syndrome and other MPS. Di Cesare et al., Parashari et al., and Amalnath et al. have also described the characteristic skeletal deformities in MS which had led to the diagnosis. MS mortality and morbidity rates are primarily related to the atlantoaxial instability and subsequent cervical myelopathy that can cause bowel and bladder dysfunction and apnea. Obstructive sleep apnea can cause prolonged periods of hypoxia, pulmonary hypertension, and even death. Thickening of tissue in the upper airway from MPS deposition can cause airway obstruction. Patients with MS have a predisposition to pulmonary infection because of progressive truncal deformity and immobility. Early onset coronary heart disease and valve thickening (aortic and mitral) with resultant cardiac dysfunction are described in these patients, and endocarditis prophylaxis is recommended. Corneal clouding can cause visual disturbance and photophobia. Enamel abnormalities in patients with MS predispose them to dental caries. Hence, these patients must be kept under regular follow-up and constant monitoring as only palliative measures are currently available for the treatment of patients with MS. Enzyme replacement therapy is under trial. MS is a rare inherited metabolic disorder that has characteristic skeletal deformities where radiological imaging can play a vital role in leading to the diagnosis even when there is no clinical suspicion. These patients have to be kept on regular follow-up to prevent from syndrome associated complications. L. Morquio. On a form of family bone dystrophy. Bull Soc Pedat Paris. 1929;27:145-52. Brailsford JF. Chondro-osteo-dystrophy: Roentgenographic and clinical features of child with dislocation of vertebrae. Am J Surg 1929;7:404-10. Kny W. Note of dysostosis multiplex type plaundler- hurler. Journal of Pediatrics 1942;63:366-77. Lowry RB, Applegarth DA, Toone JR, MacDonald E, Thunem NY. An update on the frequency of mucopolysaccharide syndromes in British Columbia. Hum Genet 1990;85:389-90. Nelson J. Incidence of the mucopolysaccharidoses in Northern Ireland. Hum Genet 1997;101:355-8. Montaño AM, Tomatsu S, Gottesman GS, Smith M, Orii T. International Morquio a registry: Clinical manifestation and natural course of Morquio a disease. J Inherit Metab Dis 2007;30:165-74. Langer LO Jr, Carey LS. The roentgenographic features of the KS mucopolysaccharidosis of Morquio (Morquio-Brailsford's disease). Am J Roentgenol Radium Ther Nucl Med 1966;97:1-20. Di Cesare A, Di Cagno A, Moffa S, Teresa P, Luca I, Giombini A. A description of skeletal manifestation in adult case of Morquio syndrome: Radiographic and MRI appearance. Case Rep Med 2012;2012:324596. Parashari U, Khanduri S, Bhadury S, Rawat S. Roentgenographic diagnosis of mucopolysaccharidosis with particular reference to Morquio Syndrome. SA Journal Radiology. 2012;2:32-4. Amalnath DS, Kalaimani S, Dutta TK. Atlantoaxial instability as the presenting feature of Morquio syndrome. Ann Indian Acad Neurol 2014;17:202-3.